Head to this compact little venue for big badass burgers. Wellingtonians do love a good burger. We dedicate one month each year to celebrating this joyous delicacy in a bun, and few things make us froth quite as much as a new burger spot in town. Rogue Burger is the newest kid on the block and believe us, it's the real deal. Perched on a breezy, laid-back spot outdoors on the Terrace, Rogue Burger is a compact little venue. The menu is in the same vein, offering a somewhat limited range, but what it lacks in variety it more than make up for with truly banging burgers. After briefly contemplating whether it was socially acceptable to order three burgers for a party of two (hint: it totally is), we decided to get the cheeseburger, fried chicken burger and vege burger ($14 each) plus a side of fries ($5). We were impressed straight away by the buns on these bad boys. Incredibly soft, spongy and well textured with a slight heft that screams quality, they feel great in your hands and act as a superb vehicle carrying the goodness within. The cheeseburger has a real classic American feel about it, packing all the essentials without any of the BS. Boasting a chunky grass-fed beef patty coated in seductively melted cheddar, surrounded by lettuce, tomato and house-made pickles, it embodies everything a good, solid burger should be. The sauce deserves a special mention, packing a superbly tangy kick that adds an extra element. We weren't going to stop by a burger joint without trying their chicken offering. 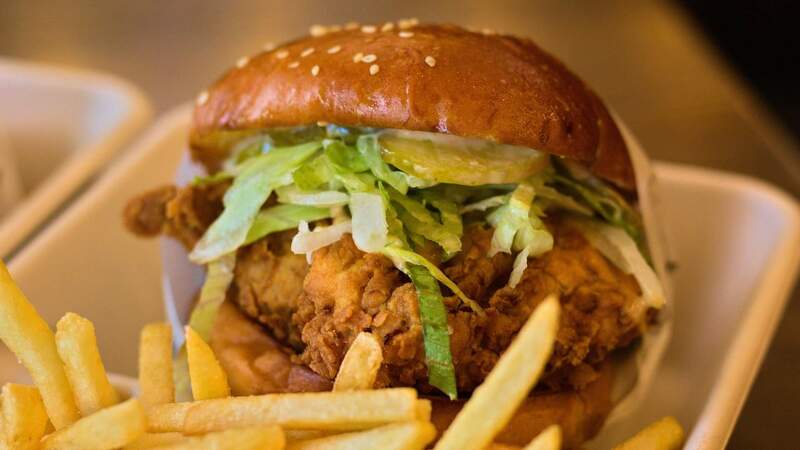 Rogue's fried chicken burger is minimalism personified, featuring a free-range fillet, pickles, sauce and a sprinkling of lettuce. The chicken was generously sized with a good crunch and once again, the sauce does a great job in coating the meat with its wonderful tang. Lastly, we were delighted to find Rogue's vege burger breaks the mould of traditional vegetarian burgers — no dry, bland faux meat patties to be found here. Instead, a big, juicy slab of smoked portobello takes centre stage. The mushroom isn't of the magic variety, of course, but don't be surprised if it leaves you in a spell. We spent the evening rotating through these three burgers between us, like some gluttonous game of musical chairs, and were left very impressed indeed. Rogue Burger is still fairly quiet, but we fully expect it to become one of the hottest spots on the Terrace.